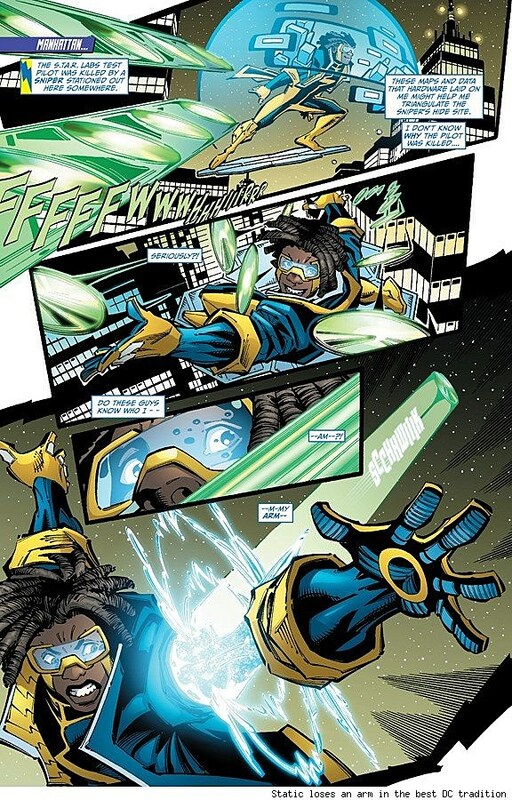 Static Shock co-writer John Rozum spoke out recently about what he said was "really going on behind the scenes" of the cancelled DC Comics title, which besides being one of the first New 52 series to be discontinued was also one of the very few superhero comics starring an African American hero in the leading role and. Fans were disappointed not just by the loss of a spotlight for the beloved character, created by Dwayne McDuffie and John Paul Leon, but by the overall quality of the book as well. Made in response to these criticisms, Rozum's remarks painted an unfavorable portrait of both his co-writer and artist Scott McDaniel and the book's editor, Harvey Richards, laying blame at their feet for the breakdown of the book. Yesterday, McDaniel responded with his own incredibly in-depth account of what went wrong with Static Shock.We took a look at Rozum's side of the story last month, when the writer put forth the story of a flighty editor and an overzealous artist who usurped his own place as the primary storyteller and drove him off of the title. Rozum claimed that the poor quality of Static Shock ultimately hurt his professional reputation. Key accusations included that McDaniel had questioned Rozum's years of writing experience by quoting from Robert McKee's popular Story: Substance, Structure, Style and the Principles of Screenwriting, that decisions on the book were made without him, and generally that Richards and McDaniel mortally wounded what he could have made a successful book by smothering it with their own vision. I'm sure Harvey actually had better data than I did (I only had Diamond Estimates, and no clue to the level of digital comics sales). Harvey was just as concerned as I was, so I assumed the Diamond Sales Estimate was pretty close to the ACTUAL sales (at least for STATIC SHOCK). To me and Harvey, the best chance for STATIC's survival was to plan big, exciting stories. Create solid story that QUICKLY grew to important and dramatic climaxes for Virgil and Static. There was no time to play it safe, or to do slow-burn stories. Time was our enemy. We needed something nearly geologic to upset the repeat of history in order to keep the book alive. John dismissed this information, and our strategy, entirely. In his opinion, Harvey and I were too concerned with sales and gimmicks and not legitimate story. This part of McDaniel's account would appear to jibe with that of Rozum, who said, "There was more concern about seeing that the title sold and didn't get cancelled than there was in telling good stories." Rozum specifically criticized shocking (no pun intended) plot twists like Static's sister being cloned and the hero's arm getting cut off, and felt that McDaniel and Richards' interference was killing the quality of the story and thus the sales. If you started ANIMAL MAN at the same #1 level as the six cancelled series (imagine grabbing that red line and dragging it downward until it overlaps the 6 titles at issue #1), IT TOO WOULD BE FACING CANCELLATION at this time. John, your argument fails. The difference: ANIMAL MAN had larger fan support. ANIMAL MAN debuted clearly higher than all the cancelled books. It'll survive the historical cooling pattern. Fans of ANIMAL MAN, REJOICE! Second, for all the "turd" bashing, STATIC SHOCK is performing exactly as the other titles are performing. In fact, the STATIC SHOCK line is on the graph - it's just perfectly buried under another data line! ALL are cooling historically. They just didn't debut high enough to survive. None had enough fan support. I know John is very proud of his work on XOMBI. That's great. He's never expressed any indication that he suffered editorial interference on Xombi, so that's out of the equation. So why didn't Xombi soar? Xombi was cancelled because of low fan support. 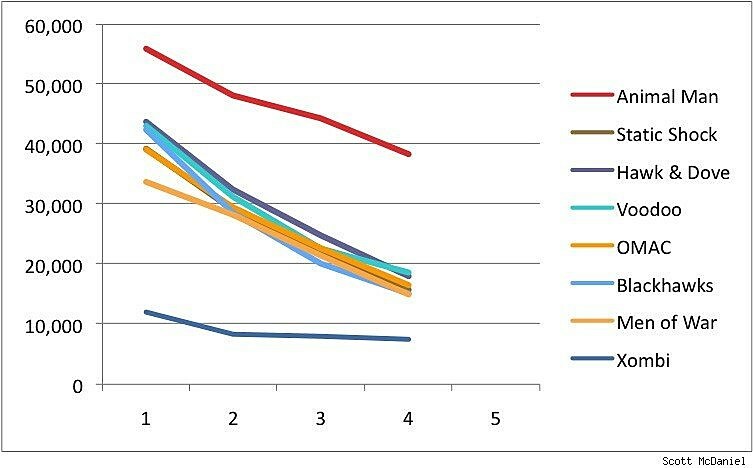 You can see it on the graph, way down at the bottom! That's not an indictment of the quality of the XOMBI creative material - it's simply a matter of not enough fan support. Just like STATIC and the other cancelled titles. Again, I asked [Rozum] to simply state what he planned to do with Static. Just describe what challenge he'll face, or what he'll learn. How he'll grow. John replied that he didn't know yet. He hadn't yet written that part of #6. Frankly, I was stunned. And boy, I felt those old familiar urges returning hard and fast. [It is unclear what urges McDaniel is referring to] John was the writer in charge, and he couldn't say where he was going with the title character. I asked him how he could possibly write issue #4 without knowing where he was going in #6. He replied it wasn't necessary to know that yet. Crom and Mitra! I think steam literally shot out of my ears. This guy was steering the boat, and I feared he didn't have a clue where he was going with the lead character. I suggested to John and Harvey that we make the "Dwayne G. McDuffie Center for Science and Mathematics" a charter school, entirely funded and staffed by S.T.A.R. Labs employees, as a way to give back to the community, bringing excellence in math and science to the urban inner city community of Harlem. It was great - we could bring the S.T.A.R. Labs to Virgil, and keep Virgil surrounded by a fun, youthful supporting cast. This is important, and it rings like a bell in my memory: John literally laughed out loud at this idea, and muttered something like "that's ridiculous" as he laughed. This isn't meant to be boastful, but I thought this was a brilliant idea. It hooks all these various elements together in a fun way: the Labs, the tech, the teen supporting cast. And John literally laughed in my face. The overall portrait that emerges when you compare both Rozum and McDaniel's accounts is, frankly, a pretty sad one: a writer, an artist and an editor all tried to make a book succeed, they had creative differences, things got ugly, and now the Static Shock's enduring legacy ten years from now will be "oh yeah, that New 52 book that had the creative meltdown." It sounds like Richards and Rozum had massive creative differences about the book's direction before McDaniel even entered the equation, and McDaniel's sensibilities simply lined up more with Richards's as to how the book should be executed. Would this situation have turned out differently if McDaniel hadn't been invited to help out with the plotting? I have no idea. We can only present cross-sections of McDaniel's post, since the entire document is over 15,000 words, but if you have further interest in more details of the behind-the-scenes of Static Shock, I recommend reading Rozum and McDaniel's accounts and making up your own mind. It's a sad eulogy for a book, and an unfortunate shroud over incoming writer Marc Bernardin, especially considering he's doomed to only get two issues before the book concludes with April's issue #8.